Hope you are enjoying your summer days. 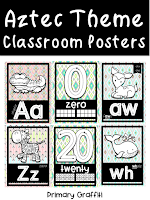 I've been working on new posters for my classroom. 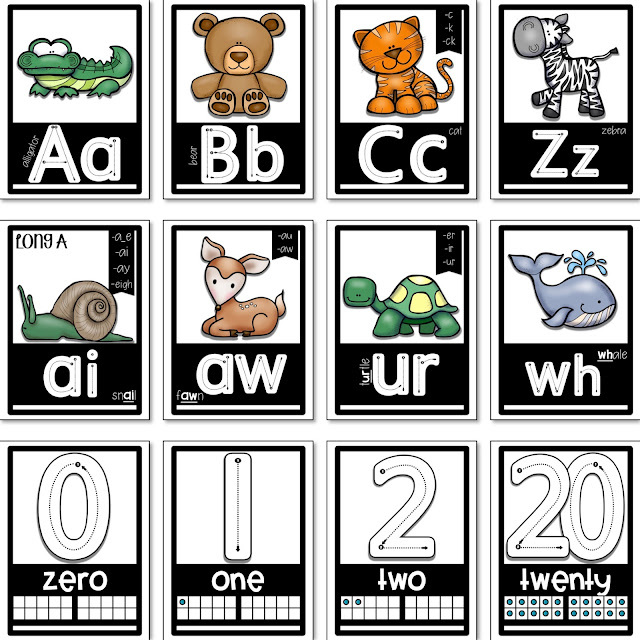 This past year, I had several options for the kids but realized I have a few students that needed alphabet or number correction. 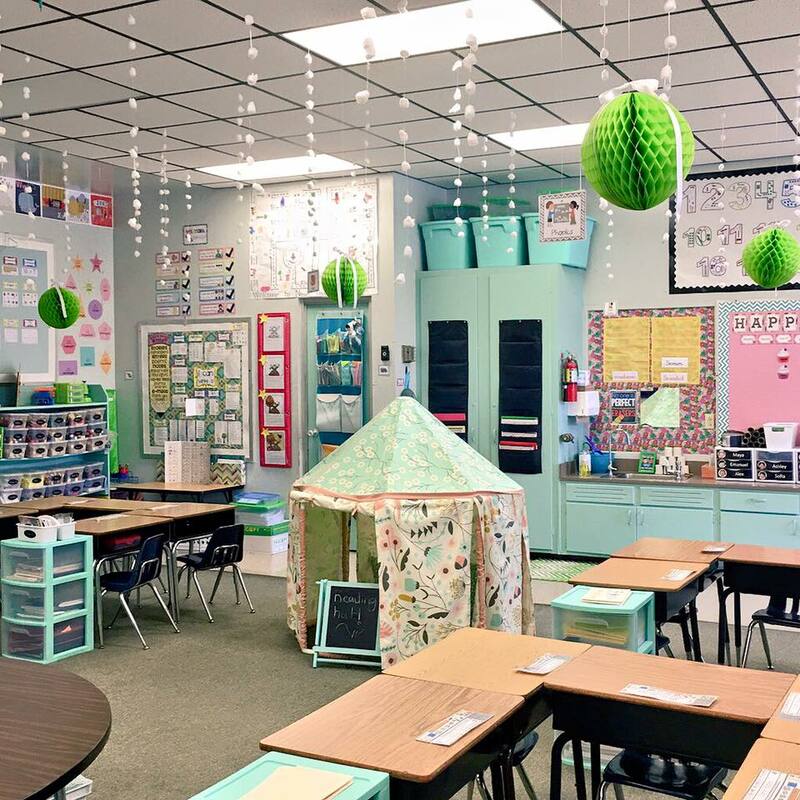 My classroom color is spearmint with hot pink and lime green accents. This year I'm changing from my fabric boards to reuse it to recover my seat crates. I will be adding distressed wood bulletin backgrounds for a shabby look. In Florida, we make our own snow. Just prior to school letting out, I began looking into subtle changes to my environment. This will be year three in this particular classroom. The color scheme will stay because it's my happy place. My eyes have been gravitating towards Aztec designed clothing at the stores so I decided to browse TPT for digital papers. I was over-the-moon when finding an adorable collection that matches my colors perfectly! I'm aware the background color can be more than some are willing to print so I prepared a new file with color images and a white background. This should assist you in printing costs. I know many do not have access to color printers so I wanted to make sure there was a copy available for those that print without color. A blackline series is perfect for printing on colored paper or having the students color in the graphics. Each phonemic awareness and phonics poster was created with animal images. There are 27 alphabet posters with two different options for the letter x. There are 16 phonics posters with additional spellings shown on a bunting. 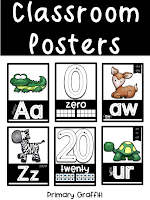 Number posters include the formation, spelling and tens frames for zero to twenty. A-Alligator, B-Bear, C-Cat, D-Dog, E-Elephant, F-Fish, G-Goat, H-Hippo, I-Iguana, J-Jellyfish, K-Kangaroo, L-Lion, M-Monkey, N-Narwhal, O-Ostrich, P-Pig, Q-Quail, R-Rabbit, S-Snake, T-Tiger, U-Uganda Kob, V-Vulture, W-Walrus, X-Xray Fish AND Fox, Y-Yak, Z-Zebra. Long A (a_e, ai, ay, eigh) Snail, Long E (e_e, ee, ea, ey) Eagle, Long I (i_e, y, ie, igh) Fly, Long O (o_e, oa, oe, ow) Toad, Long U (u_e, ew, oo, ue) Newt, AU/AW-Fawn, OI/OY-Oyster, OU/OW-Owl, AR-Jaguar, OR-Horse, ER/IR/UR-Turtle, CH-Chicken, PH-Dolphin, SH-Sheep, TH-Sloth, WH-Whale. Click one of the covers below to link over in my store. 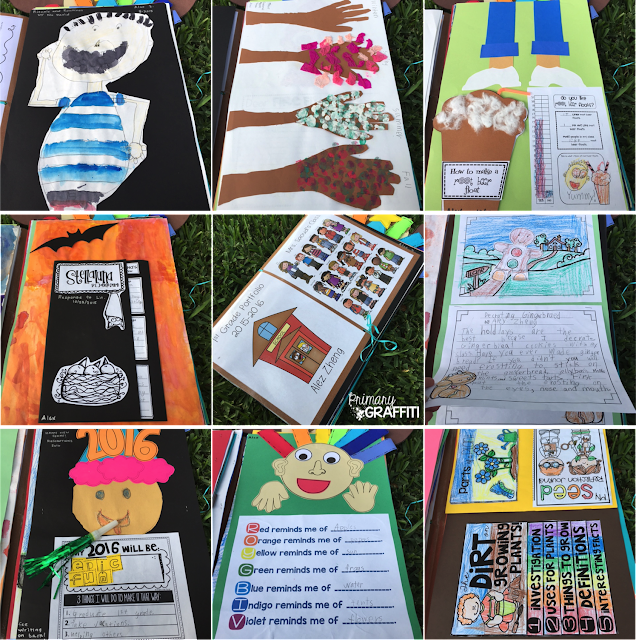 Student portfolios help our littlest learners become active participants in their learning and evaluation. By todays standards, portfolios showcase student accomplishments through art and writing. My teaching philosophy is centered around a belief in developmentally appropriate, hands-on activities. While students work through tasks, I intentionally listen in to their discussions centered around concepts, skills or themes taught. Allowing time for a art opens the door for additional discussions while working on coordination. Student portfolios are a powerful tool. It shows new instructional focuses and growth over time. Allowing your students time to interact with the portfolio artifacts helps motivate the kids to extend their thinking when working on the next portfolio project. I'm never really sure what content will be in our portfolios at the start of a year. My current class typically guides my instructional focus. To provide continuity throughout the portfolio, all selected projects are adhered to 12x18 construction paper. This provides a visual effect of clean lines but also allows for a contrasting color for a background which provides a little wow factor. Each artifact is put on display for the month in our classroom. I want the kids to see a variety of ideas on responding to texts, writing genres and illustrations. I've noticed kids becoming aware of specific skills through a share time. Through discovery, these kids gravitate to the "scholar" that shared their unique prospective and ask for assistance. Whether it's a drawing, spelling, a writing idea, or perspective on a response, the kids are fascinated by each other's monthly project. August. Notice the Rules with No David in the top left corner. This shows the display on the other side of my classroom. September. Seasonal Apple Trees from our Jonny Chapman unit. October: Stellaluna Response to Literature behind my student. February: Rotating from Groundhogs to Presidents Day. Notice the windows above. It's a timeline of our year on display. We are an outdoor school. No one ever sees what is happening inside the classroom so I shared a student's progression throughout the entire year. I will admit, finding a spot in my classroom to continually store their projects without folding them was a challenge but I made it work. I placed a folder between each student. At the end of the month, I waited for dismissal when all chairs were on the table. I passed out the collection of work. When the bell rang, students placed the portfolio on their chair. Having the work on chairs provides a workable, standing height for me. After students dismissed, I added the next artifact to the back of their already chronological collection. I like to take a few minutes and write the month and type of project (narrative, response to literature, informational writing, etc) on the corner of all their pieces. At the end of the year, I prepared the portfolio as a gift to my students and parents. It's always a hit. I wrote up a short narrative about each project. The month and type of project is included in the narrative so it's easy to identify in the portfolio. This year I added a class picture using clipart. Katie from Little Kinder Warriors shared this idea on social media. I also created a cover to the portfolio that I thought was simple but darling. You may recall, I adhere all projects on 12x18 paper. 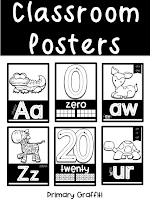 To provide a way for children to carry home their projects, I purchased 24x18 paper on Amazon in a neutral color to wrap around the collection of work. A few hole punches are needed to loop string through which will assist in tying the project closed. On the back of the portfolio cover, I created a personal instagram feed. The kids loved sharing the memories with their families. I received several personal messages written back from parents about their favorite activity or pictures from the gift. That's what makes this experience so amazing! The Instagram is from Ashley Marquez of Teach Create Motivate. Many followers on my Instagram account asked that I share a blog post with the artifacts, linking them to the source. So below, you can click on the portfolio images for a direct link! This was a guided drawing to go with rituals and routines. The idea came from Sara Cooley of First Grader At Last. Search Pinterest for Seasonal Apple Tree Handprint Art. This is from Jessica Travis of Wild About Firsties. This is from Cara Carrol of The First Grade Parade. 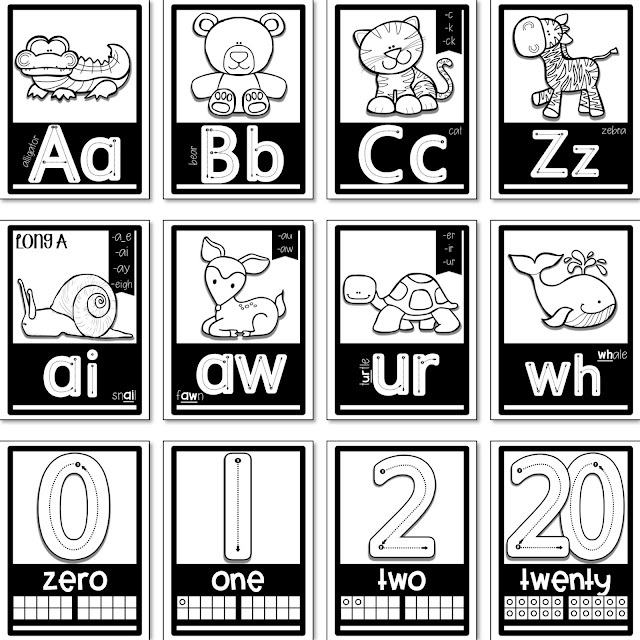 The free guided drawings are on Learning with Mrs. Parker's blog. This is my Gingerbread Book Companion Freebie. The cap was a freebie from Teresa Potosky of A Cupcake for a Teacher. The response is a freebie from Mel Lloyd of From the Pond. The back was a narrative from my book companion. I used my groundhog book companion to guide our learning. This is from Deanna Jump's American Symbols Unit. This is from Bonnie Kathryn Teaching. Enlist volunteers to cut! This freebie is from Ashley Reed of Just Reed. This informational file is from Alisha Peare of The Bubbly Blonde. This ROY G. BIV freebie is from my store. This free direct drawing is from Jennifer White of First Grade Blue Skies. This free direct drawing is from Elyse Rycroft of Proud To Be Primary. The Point of View Response is from my Duck Rabbit Companion. The Adventures of Bunny Peep freebie is from forkin4th. This unit is from Cara and Abbey's Science of April. This plant freebie is from All Students Can Shine. Each of the crafts/writing came from Today in Second Grade. This came from Deirdre Eldredge of A Burst of First. I hope you found a fun new resource or inspired in some way by this post. It's a labor of love and treasured by all.